Anyone who has ever owned a Siemens appliance will know that they are amongst the very best available, comfortably filling the niche for high-end kitchen hardware at incredibly reasonable prices. The HS858GXS6B oven is absolutely no exception to this. With this offering, Siemens have truly outdone themselves. 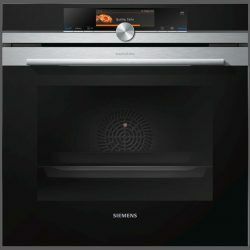 The main feature of this black stainless steel single oven is of course fullSteam technology, alongside the Siemens mainstay Home Connect Wi-Fi integration. We have this on display, fully operational, if you’d like to see it in action; the feature is truly a huge time save. Manage all of your appliances from one central location. All external metals are high quality stainless steel, including the disc control on the front. Keep everything clean with absolute ease hanks to ecoClean technology; the oven features a special coating of ceramic particles which breaks down grease and other cooking residues, which can then be wiped by hand. No cleaning products and nasty chemicals required! Get the perfect cooking result with roastingSensor Plus and bakingSensor; never burn dinner again. Also important to note for our Jewish friends, the HS858GXS6B is fully Sabbath compliant. Other features include a tank empty indicator, 15 steam cooking methods including Siemens’ brilliant 4D hot air (excellent for reheating pizza), and a handy plate warming setting. For cooking fans the HS858GXS6B includes a dough proving setting, which if you’re not aware is the final stage of rising before baking takes place. Not to mention the large format colour TFT touchscreen, showing super clear text and full colour images. This mixes a futuristic edge with modern advances in cooking technology. Physical specifications are 1 litre water tank capacity, one wire shelf, three stream containers at small and extra large sizes. Both perforated and unperforated. Absolutely worth mentioning is the inclusion of 3 telescopic shelf rails, which help prevent burns. Simply slide out and do what you have to do.